In 2019, Coach John Corona begins his 17th year at the helm of the King Track and Field program. He brings a total of 40 years of coaching and administrative experience to the job. 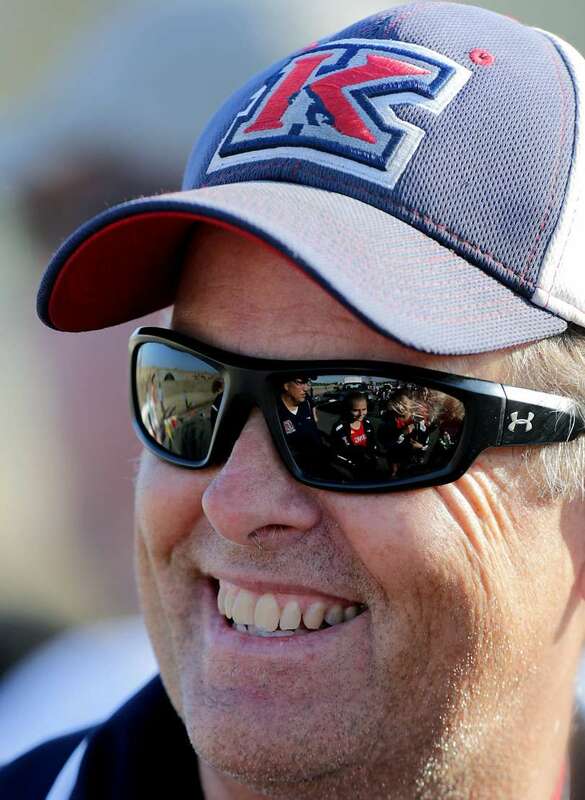 Under his guidance, the program has won a total of 5 Sunkist League Championships; 3 Ivy league Championships and 4 Big VIII championships as well as 13 straight top ten finishes for the boys and girls teams in the Riverside county Team rankings. In 2016, the boys finished 4th in CIF Division 1 and 13th in the state of California…their highest ranking ever. He has been a League Finals Manager 10 times in his career. In addition, he has been the Meet Manager for the King Soph/Frosh Classic for 15 years and the Meet manager of the Raincross Tradition-the City Track Championships since 2010. He has also been a part of developing the new Riverside City championship Cross Country Course and helping to bring CIF (SS) Cross Country Prelims and Finals to Riverside. 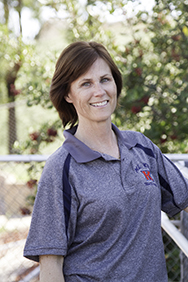 Corona has been at King since Fall, 2000 after serving at Arlington High for 21 years-ten as head track coach. He was an assistant under Brad Peters for two seasons before the two swapped positions in 2003. Through 2018, he has a career dual meet victory total of 316 (229 at King) and over 50 of Riverside County’s top high school marks are held by Arlington and King athletes under Coach Corona’s tutelage and leadership. Over the past 11 years, there has been at least one King athlete at the State Meet. Coach Corona has been named a CIF Model Coach of the Year; he’s been acknowledged by the National Federation of High school Athletics as the California State Coach of the Year and he’s been named to the President’s Award from the Riverside Sports Hall of Fame for his outstanding contribution to the Riverside community through sports. In 2018, he was named to the RSHOF Wall of Distinction and received the California Coaches Association Lifetime Achievement Award. He also was honored by the CIF(SS) in 2018 as “A Champion of Character.” He has also been named at various times by separate military/civic/educational groups as their State Educator of the Year for his work with King’s Veteran Oral History Project-King High Remembers. Corona was a three sport letter winner in cross country, basketball and track at Alta Loma High School in Rancho Cucamonga. He is a graduate of Northern Arizona University in Flagstaff, Ariz. and he has his master’s Degree from Azusa Pacific University. He is a member of the King Social Studies Department and teaches U.S. History. He and his wife Nanette have been married for 30 years and they have three sons, Michael,(2008) David (2010) and Andrew (2012), all of whom were members of the King Track program. A 2011 graduate of the King High School Track program, Mat begins his second stint with our coaching staff having already served just a year out of high school. He will be working with Coach Jones and Coach Herbert in the sprints-particularly working with the 400 runners. This only makes sense as Mat has been a fixture in the sprints not just at King but in his post high school stops at Riverside Community College and currently at UC-Riverside. At King, Mat was co-MVP his senior year and demonstrated great leadership in helping that squad accomplish great things. He went on to RCC where he helped the Tigers win two state JC championships and in 2014, he was the Orange Empire League Champion in the 400 running a sub 48. 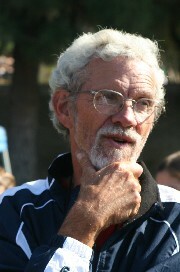 Coach Peters has been coaching high school track and cross country since 1989. In that year he started at Sonora High School in La Habra as the coach of the throwing events. In 1991 he moved to Ayala High School in Chino Hills and served as the distance coach for eight years. During that time he was blessed to have a number of outstanding distance runners to work with, including numerous league champions and CIF Finalists, four state finalists, five CIF Champions, one Master's Meet Champion in the 3200 and one state runner-up. A number of those runners went on to compete in the PAC 12 Conference and other Division One universities. 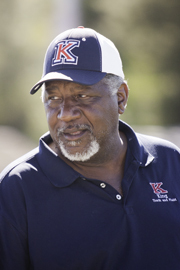 Coach Peters served as the Head Coach of Track and Field at King from 2000 to 2002 before taking on assistant coaching duties in 2003. At the helm of the distance events at King, the program has consistently succeeded at the League and CIF levels. King has been well represented at the League Finals, with one or more runners at the fore each year, including a string of 7 straight girls 3200 league champions and a league champion of both genders in one or more distance event every season between 1999 and 2010; a streak spanning four different leagues. To date, 35 distance runners have earned a League Title at King HS, spanning four leagues. Runners from both genders have achieved All-CIF, Masters, State and National accolades since King opened its doors in 2000. During the Fall cross country campaign, the varsity girls have achieved the CIF Finals13 times in 17 seasons and State in '06, '08, '09, '10 and 2016. The boys' team has been represented at the State Finals four times; in 2014 the team finished 8th. Coach Peters has been married to Rebekah since 1988 and is the father of Mackenzie. A runner since his high school days, the has enjoyed racing anything from mile to the marathon. A highlight of his athletic adventures was competing in the 100th running of the Boston Marathon in 1996. In all, he has completed eight marathons. In February of 2015, Brad Peters was named as a 2014-15 State CIF Model Coach of the Year. Coach Peters was one of 12 recipients across the state of California so honored. The annual award goes to coaches who are considered to serve as a positive role models in their school and their community and who have exhibited the traits apparent in the CIF’s 16 principles of Pursuing Victory with Honor. Within the Pursuing Victory with Honor program is the teaching of six core ethical values (the “Six Pillars of Character”), trustworthiness; respect; responsibility; fairness; caring and good citizenship. He joins three other members of the King coaching staff that have been honored with this award; Girls Tennis Coach Becky Gagnon; former head Girls Basketball Coach Ann Dena Sjoerdsma and Head Track Coach John Corona. The King Track program is extremely fortunate in having Reynaldo Brown join it’ coaching staff in 2008. Long time track fans will recognize Rey as a member of the 1968 and 1972 Olympic teams. In 1968, at the age of 18, he finished fifth in the World in the high jump. He owns numerous records and titles from meets across the country and was the NCAA champion two years in a row. He has been inducted into the Cal Poly San Luis Obispo Hall of Fame as well as the Mt.SAC Hall of Fame. He was the NCAA National Champion in the high jump in 1971 and again in 1973. He was the 1971 Indoor National Champion in the high jump. From 1968 to 1976 he was ranked in the top 10 high jumpers nationally, and again ranked top 10 in 1979. In 1971, '73 and '74 he was the number-two high jumper in the country behind the legendary Dwight Stones. In 1970 he was ranked number one in the country. While in high school (Compton HS), he leaped 7' 3" and is still ranked 5th All Time in California in the high jump! Many of you may not know much Olympic history, but our coach in the vertical and horizontal jumps, Reynaldo Brown, has a storied Olympic and world class past in the sport. Coach Brown finished fifth in the high jump at the 1968 Mexico City Olympic games. Reynaldo Brown was 18 then! We are honored and pleased to have coach and Olympian Reynaldo Brown taking our jumpers to new heights! Another alum joins the King coaching staff this year with the addition of Vince Baum, Class of 2011. Vince, currently working on his Kinesiology degree at Cal Baptist University, will be assisting Coach Duffy in the horizontal jumps. Coach Baum lettered two years in both varsity football and track while at King High. In track, he competed in the hurdles, the long jump, and the triple jump and served as a team captain in 2011. Upon graduation, Vince enlisted in the U.S. Marine Corps and served four years, stationed mostly at Camp Pendleton. He served in Afghanistan in 2014. Vince has been married to Nicolle, another King grad and former King Track Team Manager, for four years and they just recently became parents to a future Wolf, Evangeline. John Byrd joins the King Track staff this season as one of our horizontal jump coaches. Coach Byrd is a 2009 graduate of Arlington High where he lettered in both football and track. While competing for the football Lions, he was an All-League and All CIF defensive back. He also was a 4 Ivy League Track Champion in the Long and Triple Jump. He was a three time team Track MVP at AHS and served as a team captain. Coach Byrd went on to compete on the track team at Riverside Community College and was part of a state championship team while competing for the Tigers in the long and triple jump. Also, an assistant coach on the Wolves football team, Coach Byrd has six years of track coaching behind him, having worked at Arlington and Tahquitz High School in Hemet. He has worked with youngsters in the horizontal jumps; the throws and sprints. He is currently an elementary school PE teacher in Fontana Unified School District. Married this past summer to his wife Kelsie, he is a 2013 graduate of Cal-State San Bernardino and earned his Graduate Degree from National University. Ken was an All-American hurdler at Cal-State Northridge and a teammate of Art Venegas, formerly the head track coach at UCLA. 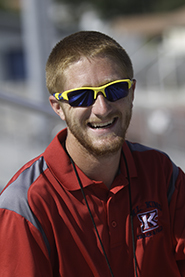 Ken has worked with both Arlington and King Hurdlers over the years and since coming to King High, he has made King's hurdle program one of the best in the Inland Empire. He has also worked with local youth track clubs over the years as well. Coach Bracy is excellent in teaching beginning hurdlers the mechanics and the mindset of hurdling. He is married to his wife, Jeanette for and has three grown children, Ken, Jr and Rashad who competed at Arlington and Zenobia, who was a hurdler for the Wolves. Arguably, one of the best athletes to ever come out of the King track program, Tayler Fleming will be taking some time out of her busy final track season at the University of California -Riverside to lend assistance to King athletes in the hurdles and most likely in a number of other events as well. A graduate of King High in 2013, Tayler has truly made a name for herself at UCR. In 2017, she was a NATIONAL qualifier in the NCAA Division -1 Long Jump and made All-American Honorable Mention. In 2016, she made the NCAA Western Regionals in the Long Jump and the Heptathlon. She has numerous Big West titles and UCR records to her credit. She set the UCR record in the Heptathlon in her very first attempt at the multi-event contest. While at King, she was a four year letter winner in track and lettered twice in soccer. Tayler was a 3 time track team MVP and owns the school record in the 100 hurdles; the 300 hurdles and the 4 x 400 relay. She was a four-time CIF qualifier and made the state meet twice. In 2013, she finished 6th at the State Meet in the 300 hurdles, the highest ever finish for a female King athlete. A major in Liberal Studies with a psychology minor, Tayler graduates from UCR in June. 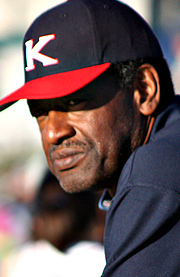 Coach Edwin Jones has a long history in the Riverside area in track and field. He has been coaching at the high school level for a total of 30 years and has coached the sprinters at King to great heights and accomplishments since 2001. 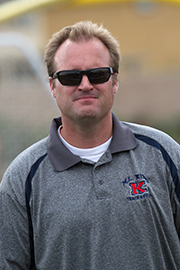 Prior to coming to King, he coached at Ramona High School for 18 years serving as an assistant and as head coach. He was an integral part of the coaching staff that guided the Rams to a CIF runner-up trophy in 1995. Coach Jones was a standout sprinter himself at Ramona High in the early 80’s and was a CIF qualifier. 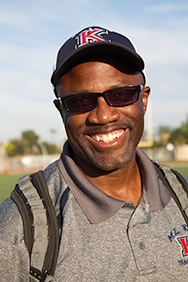 Coach Jones is one of the intramural and /recreation directors at Loma Linda University. He is married to Louise and has two daughters. King Track and Field is honored to welcome another Olympian to their coaching staff in the person of Coach Fatimat Yusuf Olukoju. Joining Reynaldo Brown as coaches who have preformed on the world stage, Coach Olukoju competed for her native land of Nigeria in the 1996 and 2000 Olympics and was a Silver medal winner in the 4 X 400 relay in '96. In 1991, She was the Gold Medal winner in the All-African Games and also made a name for herself in the 200 as well. The owner and chief instructor of Village Coach Fitness Studio, Coach Olukoju is a 1998 graduate of Azusa Pacific University. she competed in the 400 for the Cougars and was a 5 time All-American. She has worked over the past ten years with club-level track youngsters and she will be working with the King sprinters. She and her husband Adewale, another Nigeria Olympian in the discus have bee married 18 years and have four children. Jim Griesinger is father to seven children and has been on-board the program since 2001. He has been a steady contributor to all the good that has come to King track and cross country. A runner for most of his adult years, he has taken up marathoning, and has run the San Diego, Las Vegas, Michigan, San Francisco and Boston Marathons. His younger kids have been a part of the program with Steve (02), Diane (03), James (05), and Mary (06) all competing at one time for the King Wolves. In the Fall, Coach Griesinger is one of the cross country coaches, a tenure he has kept since the school opened in 1999. Coach Griesinger happily retired from the work force in February of 2009, and enjoys doing local projects for friends and fishing with his grown sons. A 2011 graduate of King High School, Carrie Soholt is returning to her alma mater to assist in the coaching of the Wolves distance group. Already having served two seasons in helping with cross country, Carrie is bringing her substantial talents and positive personality back to the Wolfpack!! During her time competing for the both Cross Country and Track, Carrie was a huge contributor to the Wolves success. In Cross Country she was on three League Championship teams; on one state qualifying team and was All-League several times. In track, she was a 4 time CIF qualifier and currently resides in King’s All-time top ten in the 1600 at 5:10.3. While at King, she was the recipient of the MLK Service Award; a Scholar Athlete; the Wolfpack Pride Award winner and was named our Outstanding Distance Runner. The high point in her career at King (at least li the eyes of her coaches) came in her Junior year when after having won the City Championship in the 1600 meters because the runner ahead of her had been disqualified on a uniform technicality, Carrie gave up her first place patch to that same young lady. It was an act of sportsmanship that resonates within the program even today. 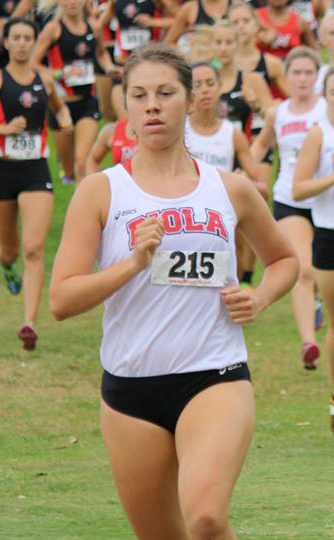 Carrie went on to compete at Biola University where she was a two time All-American (Once in Cross Country and once in indoor track) and graduated in 2015 with her degree in Kinesiology. She is currently working on her Doctorate in Physical Therapy at Azusa Pacific University. Raelyn Werley, who gradutated from King in 2013 retuned to coach in the season of 2018. Raelyn was a standout performer during her time at King, earning the team MVP honors twice while competing well in both cross country and track. She was an integral part of four years of athletic excellence and was a member of King's first team to advance to CIF State Champiionships. Despite her athletic accomplishments at King, her fondest memories are having fun at Mammoth Camp and gaining lifelong friendships. 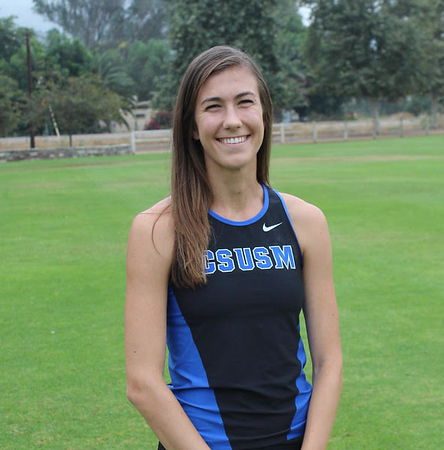 She competed for the legendary American distance runner, Steve Scott during her four years at Cal State San Marcos. Scott's leadership was revolutionary for the eager athlete, and Raelyn learned a great deal while improving and ultimately competing for the Cougars at the D2 Nationals her senior year. She notched PR's of 17:05 for 5K, 10:04 for 3K and 35:54 for 10K. Coach Scott also selected her as team captain. Raelyn graduated in 2018 with a degree in pyschology and is currently working on her Masters degree from CBU in Family Counseling. She works part time at The Grove Church's Counseling and Community Center. King High pole vaulters have been traditionally one of the top groups in the Inland Empire and that is in large part to Coach Sean Roll, now entering his fourteenth year with the Wolves track team. In that short time, Coach Roll has produced 15 league champions-numerous CIF qualifiers-and 6 CIF finalists. Year in and year out-King has one of the best pole vault records in the area. His low-key patient yet passionate approach to his event fosters comradeship and competitiveness among his charges. 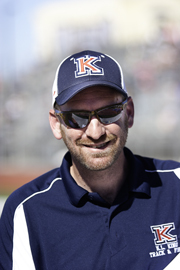 Sean is a graduate of Arlington High and coached the Lions to pole vault success before coming over to King in 1999. He has been with King since the program's inception in the spring of 2000. In 2012 Sean joined the faculty at King High School as an art teacher. If the name "Roll" sounds familair it should, especially in regard to King High pole vault. Arlan Roll, the father of King Pole Vault coach, Sean, joins our staff with the mission of working with our younger; more inexpereniced vaulters. "Papa" Roll, as the athletes have already dubbed him, served as a pole vault coach for three years at Arlington High and has worked intermittingly over the years at King. With a strong coaching and athletic background in the pole vault, Jeff McKee joins the King Track Coaching staff for the 2019 season. A local businessman, Coach McKee has coaching experience at Brea-Olinda and Santiago High Schools, not just in the pole vault but in the other horizontal and vertical jumps as well. A 1992 Business graduate of Cal-Poly Pomona and a Bronco track team member, Jeff ended his career as one of the top pole vaulters in school history. As a high school senior at Downey High School, he finished 4th at the California State Championships in 1987 in the vault. Jeff has been married for 17 years to his wife, Jenny and they are the parents of four children. 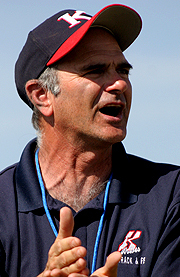 Longtime football assistant and King High teacher, Mac Cleary joined the King Track Staff in the 2013 season. Coach Cleary is a graduate of San Diego State University and has worked in the King Social Studies Department for 7 years. He has a master's Degree in Educational Leadership. He has served as a lower level coach and varsity assistant for the Wolve's football and baseball programs. He also has worked at Temescal Canyon and Ramona High Schools. While at SDSU, Cleary played for the Aztec Football team for four seasons, garnering awards such as Special Teams Player of the Tear in 1998 and Mountain West All-Academic Team. A standout athlete at Arlington High, he lettered in football, basketball and baseball. He would win All-League; All Inland Empire and All-CIF honors in football during his career. He and his wife Karla have been married for 7 years and have two children. He is also a teacher at King, working in the Social Sciences department. Ms. Birchak will be handling a myriad of administrative responsibilities such as attendance and the monitoring of grades in addition to helping with the long and triple jump. Coach Birchak is a graduate of Metropolitan State University in Denver, Colorado and holds graduate degrees in Curriculum from the University of Phoenix and in Administrative Studies from Concordia University in Irvine. She is in her fourth year of teaching English here at King High after a local stint at Chemawa Middle School and a number of years teaching in Colorado.